The Science Channel was filming an episode about the Vikings today. 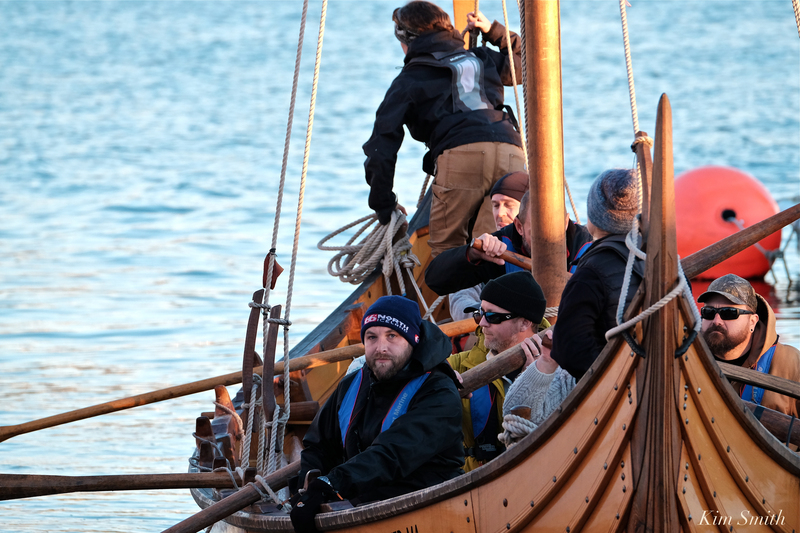 The show features the ship Polaris, a handcrafted reconstruction of an original Viking coastal fishing vessel. Polaris is docked at Maritime Gloucester. ESSEX, Mass. (AP) — Cape Ann’s fleet of vintage row and sail vessels has a new addition, one that hearkens back to mists of Viking heritage forged in the fjords of western Norway. The Polaris, a 37-foot reconstruction of an original Viking coastal fishing vessel dating to 1030 A.D., has made its way across country to the Essex Shipbuilding Museum from its birthing boat yard on Fidalgo Bay in Anacortes, Washington. The plan, according to owner Stuart Boyd, is to berth the Polaris this summer at Maritime Gloucester, where it will be available from early June on for short public rowing trips, private charters and corporate team-building outings throughout the inshore waters of Cape Ann. This entry was posted in Gloucester, Gloucester Harbor, Schooners and Tall Ships and tagged Maritime Gloucester, Polaris, Science Channel, Viking fishing vessel, Vikings on October 16, 2018 by Kim Smith.